Thank you for entrusting us with your vacation! Wallowa Lake Vacation Rentals is a family operated company with roots to this valley dating back 4 generations! We love living and raising our family here in Wallowa County and our plan is to live here when we retire. We consider ourselves very lucky to be able to have the daily gift of waking up, looking at those beautiful Wallowa Mountains. We are excited to be able to provide you with some of the best Eastern Oregon vacation rentals so you can get a feel for what we experience everyday living here! Our business was formed in 1998 when we were expecting our first child, Sarah. We wanted a career that would be very family friendly so she could always be with us. Two years later, her brother Coy joined us and the business continued to cocoon us as a family. Originally, we thought this would be a nice little supplemental business and BOY has it grown! Our first year in business, we had just one house and one "employee" (me) wearing many hats. Then, I blinked, and we were up to over 40 vacation homes, 15+ employees, and an outstanding business that continues to thrive! Many of our loyal, repeat customers have watched our family change from just Chad and me, to include Sarah, then Coy. There isn’t a week that passes that I don’t hear from one of our repeat customers that can’t believe how our business has grown, or how the children have grown! I think that is actually one of the most rewarding parts of this business—meeting people and developing a relationship that will span the times of our lives. 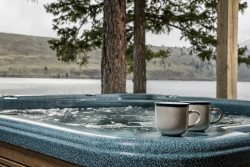 Even though we aren’t the small time operation that we once were, our mission and core values have not changed: Provide a wide variety of clean and comfortable Wallowa Lake cabins, cottage, and rental homes coupled with exceptional customer service and great Clients that will always produce 1 terrific vacation! We sincerely look forward to being a part of your vacation and we look forward to helping you find your perfect cabin rental at Wallowa Lake! I started working for Wallowa Lake Vacation Rentals in 2010. I always think these getting to know you things are great and a little silly, I mean really what would you like to know?! Morning person or Night Owl? - A little of both....but more night owl. Are you a cat or dog person? -Both. Friday night in or Friday night out?- Depends I like both! Movie or Documentary?- Movie. I do love history though. Panda or Polar bear? -Panda. Royal or Politician? - Royal. Jan started with us in 2004! She is our Friday and evening and weekend gal. Words that best describe Jan (according to Cindi & Jada) would be helpful, detail oriented, funny, compassionate and a lover of animals and people. Working for WLVR is the greatest job and it's wonderful working with such great people. Being able to work at home is just an extra bonus. I enjoy helping people plan their vacations and find the right fit for their needs. My family consists of my husband of 50 years, 2 sons and daughter in laws, and 1 daughter and son in law. They have blessed me with 7 grandchildren, 5 boys and 2 girls that complete my life. Oh I also have two dogs Daisy a Boston Terrier and Buster an English Bulldog who are a big part of our family. My hobbies consist of quilting, reading and volunteering several hours a week. We live in La Grande (75 miles from the lake) and just like at the lake, we enjoy the 4 seasons.